To mark its 150th anniversary, the Burger yard has worked with Gregory C. Marshall to create a new 42m yacht design named Liberty. The design aims to provide everything an active family could want including formal and informal living spaces, exceptional exterior areas for entertaining and easy access to the water for swimming and watersports enjoyment. The large main saloon and dining area can be easily transformed into a lavish indoor/outdoor area by simply opening the port and starboard double sliding doors and the aft curved sliders. The luxurious full-beam main-deck owners' stateroom includes a large lounge/office area, his-and-hers en suite baths and generous closets. The main entry foyer features double curved open staircases, one leading to the lower guest accommodations and the other to the upper deck. The guest accommodation consists of four fully appointed staterooms with en suite baths. The upper deck includes a skylounge, which opens to a private deck aft, a captain's stateroom and Liberty's command center. Liberty's spacious crew lounge and well-equipped laundry facility have direct access to the guest areas for ease of housekeeping. Aft of the engine room is the yacht's tender garage which holds her 6m tender and various water toys. 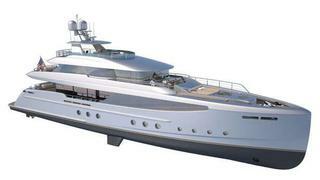 With the tender launched, the aft portion of the tender garage becomes an extension of Liberty's swim platform.